Engineering has built our modern world. Everything from skyscrapers to roads and air travel exist because of advances in engineering. What happens when engineering goes horribly wrong? Engineering Disasters goes beyond the headlines to uncover what really happened in the most notorious engineering accidents. What caused an outdoor stage to collapse in Indiana, killing seven? How did a collection of classic Corvettes disappear right out of thin air? Why did a plane's fuselage rip open in mid-flight? What was behind the collapse of a domed stadium? 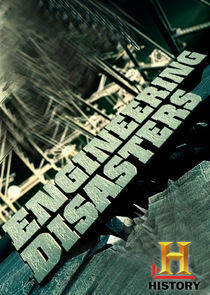 Each hour long episode combines expert and eyewitness interviews, state of the art graphics and dramatic ‘moment of disaster' footage to tell the story behind the world's most terrifying engineering disasters.